A trip was made to the hangar on Sunday to continue with the inventory of the remaining few larger pieces in the RV-12’s finishing kit and to count contents of the numerous paper bags. Bags that contained small hardware or rivets were set aside to bring home for counting and placement into parts trays. 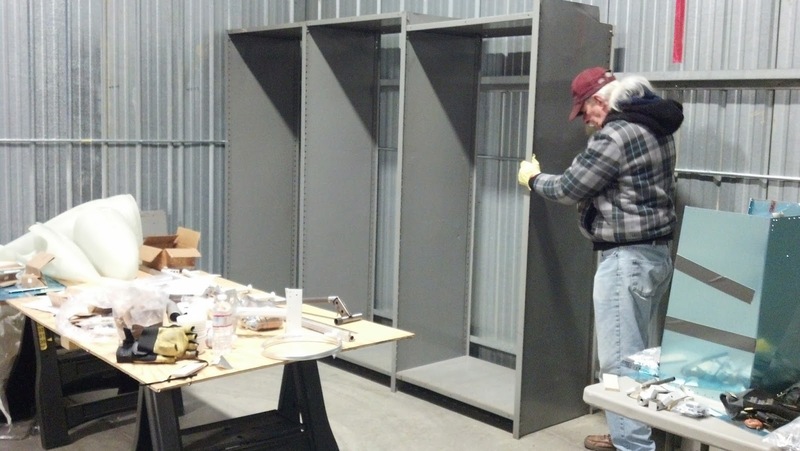 Mike swung by the hangar to lend a hand with the assembling of some steel shelving I had brought up to the hangar from the southern outpost. Apparently Mike got off a shot from his phone while I was adjusting the position the shelving frame before we began filling it with shelves. After assembly of the shelving was completed, Mike and I finished up counting the contents of the paper bags I was not going to take home. The remaining bags of hardware were taken to the house where it was much warmer to work. So Sunday evening and Monday was pretty much consumed by sorting, counting and pigeon holing the plethora of small parts, rivets and hardware into the parts trays ... plus making labels as necessary. There are quite a few bushings, cushion clamps and various bearings that still need to be placed into trays so will swing by Harbor Freight and procure another parts tray or two for all smaller miscellaneous and oddball parts. I prefer working from parts trays instead of the paper bags and here is why. The parts in the trays can be seen through the lid for one. Secondly, Van’s will often place similar items into a bag say 4 of one cotter pin and 6 of another so you know what the part numbers are based on the count in the bag … however, as parts are removed from the bags, it can become difficult to identify parts because the parts count in the bag has changed. All the parts trays are loaded up again and ready to disperse RV-12 parts as needed. Once again, I have to give credit to Van’s … they did a great job packing the crate and nothing appears to have been damaged. There were a couple of small minor discrepancies ... I received all the major parts except I was shorted four small screws from one bag and missing some small nuts altogether from another bag (they were the last item on the list for that bag) but had about the same amount extra of a nutplate in the same bag ... so guessing the person filling the bag just got confused and counted nutplates in place of the small nuts. A call to Van’s has the missing parts in the mail.